Station-area development that is compact and dense relative to its surroundings. TOD seeks higher density for a simple reason: concentrated developments makes it possible for people to live, work, shop and go to school within walking distance of MARTA. This not only generates revenue for MARTA and other transit providers, but it also allows residents to make regular use of alternative transit. A rich mix of land uses. TOD creates mixed-use developments that help people live all their lives more conveniently. By taking a live-work-play approach to these station areas, TOD strengthens the link between transit and development. The areas become more than transit hubs or stops on a route. They become destinations where people choose to spend their days — all with the convenience of on-site transit. A great public realm. TOD places people and pedestrians first, especially within the quarter-mile radius involved in most daily commutes. In a mixed-use environment, short blocks and grid-based sidewalks navigate throughout the development. These streets, sidewalks, plazas and transit stations are safe and accessible — dotted with attractive amenities, clear lighting and easy-to-follow wayfinding. A new approach to parking. Even with high transit utilization, people still use cars to come and go — and they'll need a place to park when they do. TOD aims to make parking a natural, non-dominant aspect of mixed-use developments, reducing the number of necessary spaces and providing incentives that regularly free up parking. All the while, these parking spaces are designed to blend in directly with the overall look and feel of the area. For a detailed look at this framework, check out our Transit Oriented Development Guidelines. 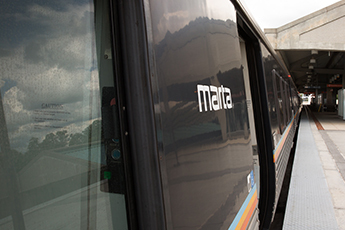 As part of our commitment to facilitating these guidelines, we've also established a set of policies related to development projects on MARTA property or within MARTA's areas of interest. Read through our Policies for Implementing MARTA's TOD Guidelines for a detailed look at the seven main policies.